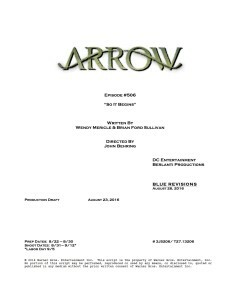 Arrow #5.6 Title & Credits Revealed: So It Begins! Marc Guggenheim has revealed the title and credits for the sixth episode of Arrow Season 5. Marc Guggenheim has revealed the title and credits for the sixth episode of Arrow Season 5. The episode is now beginning production. The title of Episode #5.6 is “So It Begins” and it is written by Wendy Mericle & Brian Ford Sullivan. The director of the episode is John Behring.